We have already talked a lot in this blog about training chatbots, the issues bot builders encounter in this task and our tips to enhance its performance, no matter the NLU platform they are built on. Dialogflow, Lex, LUIS, we have studied them all. The common problem we always see is the data sparsity. That's why the trend right now is to offer predefined agents or intents in certain domains. But that's not the perfect solution, either. Let's see other approaches. Natural Language Generation (NLG) solution: obtain a high-quality dataset training that is easy to use and free of noise within days. Query Rewriting: stop worrying about finding a corpus of training phrases that are complex and different enough to train your bot, and feed it only trivial sentences. The Query Rewriting middleware will do the rest. Taking charge of the whole training process for you. In TechCrunch's case, the Query Rewriting service was the one applied. As it was an existing bot already working, the solution had to be flexible enough to integrate into the current architecture. The rewriting technology was perfect for that because it acts as a NLP layer that allows the bot to understand any kind of query, boosting that way its NLU performance. Why are we so obsessed with simplifying the training process? There are deploying times that cannot be reduced: the designing of the bot, i.e., deciding its purpose, its personality, or the intents and entities it is going to handle is crucial and shouldn't be be done in a hurry. Then, it has to be built, which doesn't usually take much time. But if there is a clear black hole of time in bots developing projects, it is the training phase. It can take months to get users to interact enough, in quality and quantity, for the bot to learn from them. That's why everyone who is thinking of developing a bot for their businesses is running to start their projects, just to be the first of the race. To us, this race seems insane, even more when there's no guarantee the bot will become fully functional at the end. We go instead for a different approach: a short, controllable training process that is aimed to improve the "brains", and not the "looks", of the chatbot. That way businesses can benefit from implementing their bot with complete confidence in the technology. 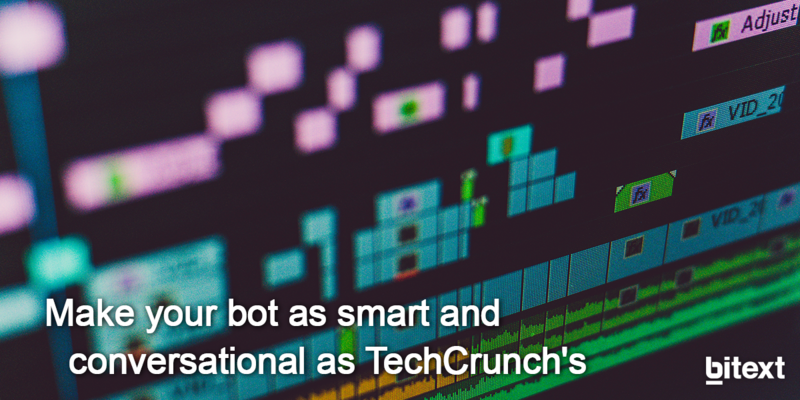 If you want to see how we can help you to train your bot faster as we did with TechCrunch, download the use case below, and feel free to contact us anytime.